Organizing my fabrics last weekend proved to help my productivity this week. I guess digging through messy heaps of fabric on the floor eats up time. Neatly folded piles make it easier to see & get to what you have. 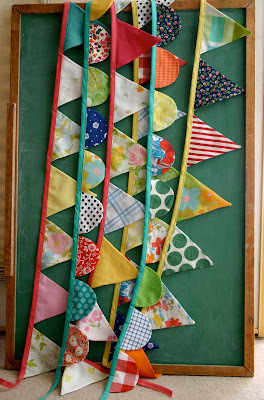 Well, the result of this organization...I was able to get a few flag garlands completed for the shop. Check them out if you have an upcoming party or a spot in your house or backyard that needs a little something to make it more festive! OHHH! i loveee! so cute! i need to make some for my daughters room! I love your new profile pic! Wow, I just love your garlands! They are the perfect (and eco-friendly) decorations for a fun birthday party. So pretty! I love garlands, and seeing them all together like that makes me smile!